It’s a buyer’s market in the AR-15 world right now, a true golden age for America’s favorite rifle! 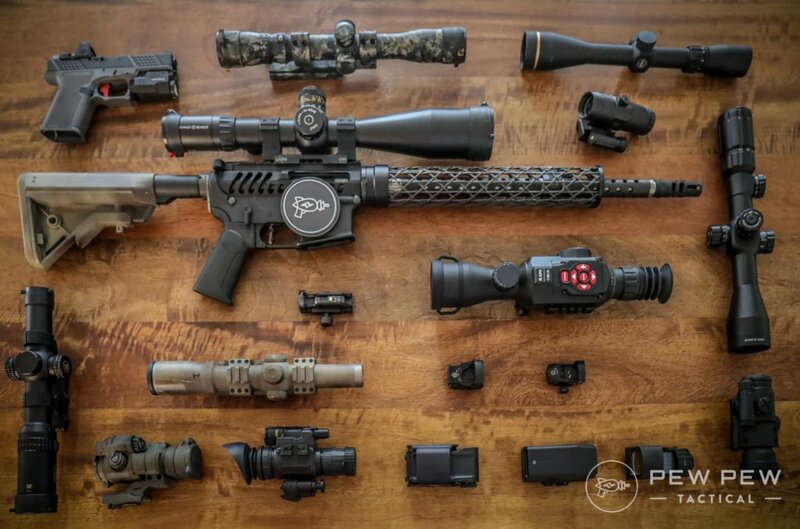 For any budget, for any goal, any color, and in almost any caliber these days – you can find an AR for you. But that can be overwhelming quickly, like a Vegas buffet sometimes there are just too many options. If you’re looking for a jack-of-all-trades that isn’t your average starter rifle, then the Sig M400 Tread just might be the right rifle for you. Whether for hunting varmints, dabbling in 3-gun competitions, a recreational rifle, or buying a defensive rifle, in my opinion, the Tread does just about anything and does it for a very reasonable price. While waiting on my FFL to finish the background check, out of the box everything was exactly the way it needed to be. My first glances at the rifle went directly to the castle nut mounted to the receiver extension. I was happy to see that Sig properly staked the end plate to the castle nut. While this is a minor assembly procedure, some companies to save expense no longer stake the castle nut properly. When a company makes sure the little things are done correctly, it tends to speak volumes on the bigger things inside of the rifle. Speaking of staking, the bolt carrier group upon inspection also looked to be staked appropriately and with the correct Grade 8 hardware. Staking in these spots provides an added insurance policy in reliability and dependability. 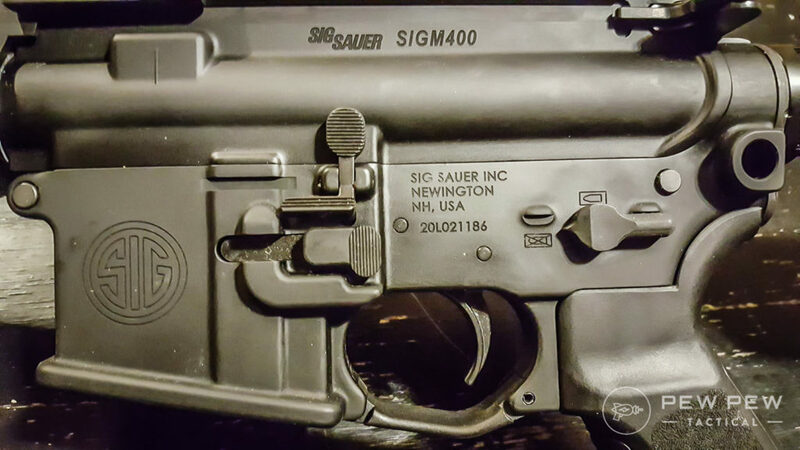 Another great touch is Sig’s lower receiver that utilizes a built-in quick disconnect socket. Adding a sling to the rifle with a QD sling attachment is fast and easy. To round off the package, the rifle sent to me also came with a Romeo5 red dot and a PMAG 30 round magazine. Everything seemed tight, well assembled, and ready to get on the range to do some shooting. Looking over the rifle, another item that caught my eye was the 3-Pronged flash hider that comes standard with the M400 Tread. It is highly functional, and not once did I notice a fireball from the rifle, even during a shooting session that was later in the day. It adds some style to the rifle, and it didn’t have a tuning fork quality like other pronged muzzle devices on the market. The barrel is a 16” 416R stainless steel with a mid-length gas system and 1:8 rifle twist. 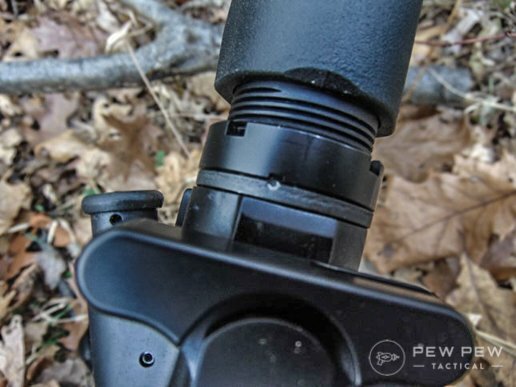 While 3-Prong flash hiders aren’t known for their recoil compensation, the rifle shot very flat and smooth. This can be attributed to the mid-length gas system and the appropriately sized gas port. Sig Sauer is using great barrels for the Tread. The Tread that was shipped to me came with their standard 15” Tread handguard in MLOK. Aesthetically, I had my doubts at first. I am more comfortable with a full top rail on a slim handguard, but after wrapping my support hand around the slim grip, it provided a very stable platform. 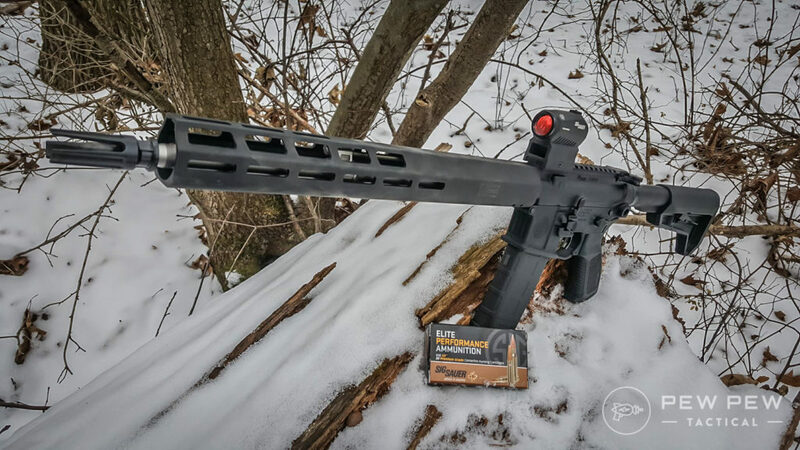 Using a C-grip on the ultra-slim handguard gives a shooter a very comfortable grasp on the rifle to really drive the muzzle on multiple targets and reduce muzzle flip. The Tread’s trigger, while better than most mil-spec triggers, is still very similar to single stage triggers. Weight is on the lower end of mil-spec between 5-6 lbs., but it is a very smooth trigger with little to no grit. Reset was positive and quick, and shooting fast was no issue with their trigger. Without changing the trigger to a match drop-in unit, I was still able to shoot sub-MOA groups with certain ammunition. The other controls on the Tread are enhanced as well. Between the stylish, oversized bolt release, and the fully ambidextrous magazine release, it’s the little things that make this rifle feel good in the hands and while in your shoulder. The ambidextrous safety is also well built and doesn’t feel cheap like some designs of lesser quality. The grip on the rifle is a nice touch as well compared to typical A2-style grips. It is Sig’s own design and the angle of the grip is comfortable, but some people may like more of a reduced angle grip. The stock is a Magpul SL-K and it proved to be very comfortable. It has a smaller footprint compared to other stocks on the market, but its size and weight work well. The stock was comfortable for a cheek weld without feeling fat on the sides. The barrel on the M400 Tread sent to me was a shooter. 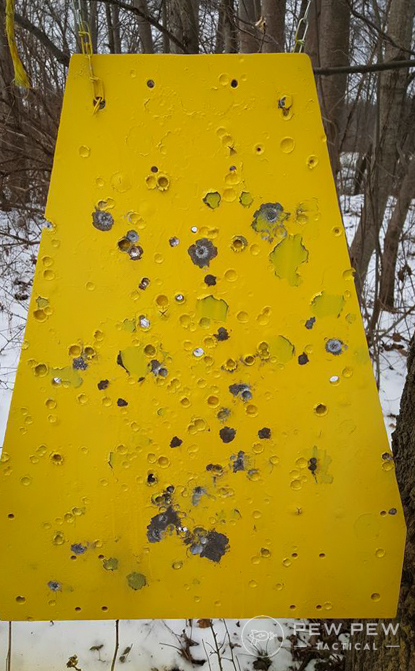 Shooting from a bench with Caldwell bags, I began to test out a few of my personal favorite loads, as well as some Sig Sauer 60 grain HT factory ammo. This was my first time with Sig Sauer ammunition, and it did not disappoint. Optic used was an ACME Machine 6-24x50mm with a first focal plane reticle. 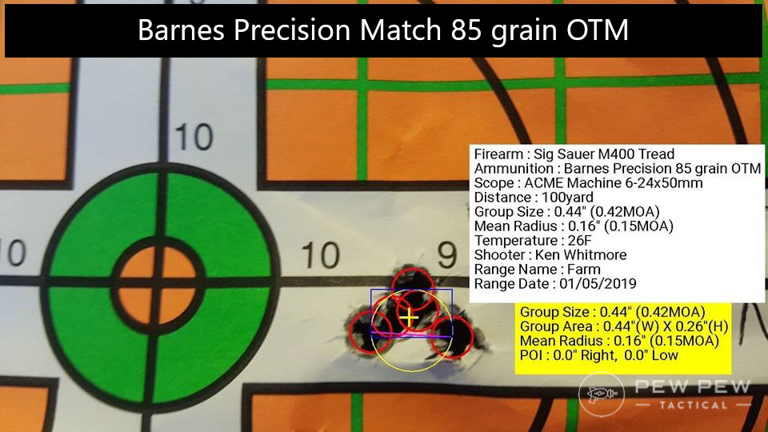 The first match grade ammo that I put through the rifle was some Barnes Precision 85-grain OTM. This is some heavy stuff to shoot out of an AR15 mag-well, but I haven’t been disappointed with it yet. It may be a little heavy for some 1:9 twist barrels, but with a 1:7 or 1:8 twist I have had success. My best 5 shot group produced a .42 MOA group at 100 yards. Anything that can produce a sub-.5 MOA group is money in my book. 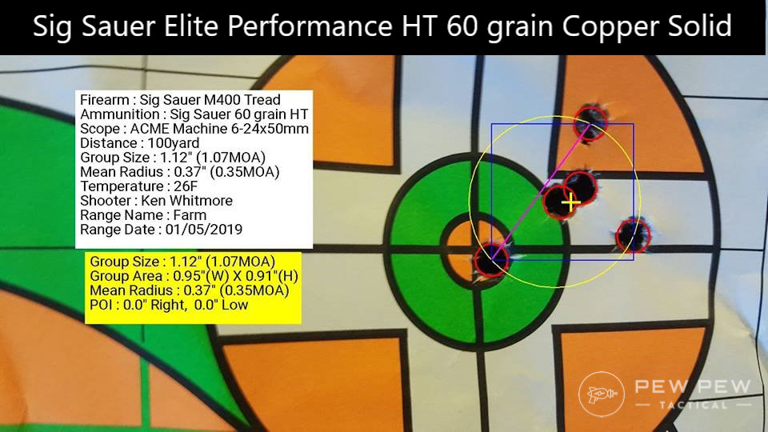 The second load I put through the M400 Tread was Sig Sauers own Elite Performance Hunting HT loads in a 60-grain copper solid. My best 5 shot group yielded an impressive 1.07 MOA group at 100 yards. For a factory load marketed towards hunting, this would be a heck of a load for varmints due to its solid copper, expanding design. 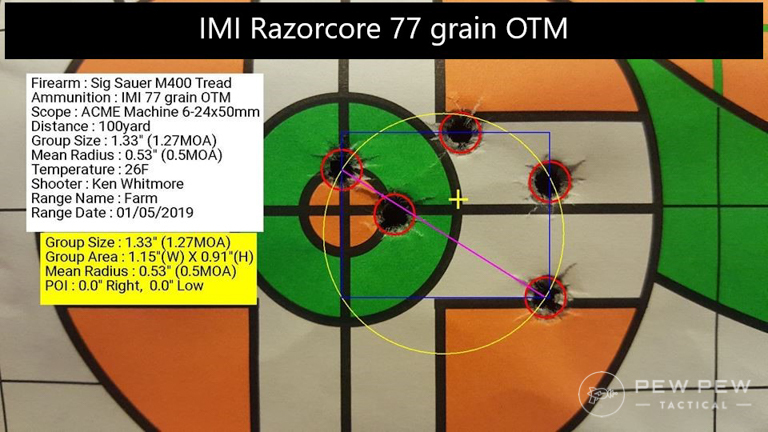 Finally, a load from IMI in a Razorcore 77 grain OTM load did not do as well as I was expecting. It still shot great from the rifle considering it is not marketed for precision work, but I was expecting a little better based on previous shooting with my other rifles. It came in at 1.27 MOA with a 5 shot group at 100 yards. In today’s industry, with the technology and quality control that we have, it seems most AR15s can be great shooters out of the box. The M400 Tread is no exception. Since the rifle is more than capable of minute of angle shooting with appropriate ammo, in my opinion, the M400 Tread’s 416R stainless steel barrel provides excellent accuracy at its price point. For precision work though, I would upgrade to a drop-in system to tighten up your groups. After I finished up running accuracy testing, I spent a few days at my cousin’s farm pushing the rifle as hard as I could. Between shooting for speed to test for failures and running shooting drills on multiple targets at multiple ranges, the Sig M400 Tread kept up with me and ran without a hiccup. During my time with the rifle, I fed it popular bulk ammo such as Wolf Gold, Federal XM193, and even some 55-grain steel cased Tul-Ammo. It kept eating without any worries, and I was even able to make hits with the Romeo5 at 400 yards on a steel silhouette. The Romeo5 provided a clear and concise dot that I was able to drive from target to target. The handguard, which grew on me the more I handled it, provided an excellent wrap-around grip for shooting fast at multiple targets. As stated above, I can not stress how well this rifle stays flat while shooting. Kudos to Sig for properly sizing the gas port on this mid-length barrel. In a world of over-gassed carbine length barrels, a properly gassed mid-length barrel is a game changer that’s gaining more popularity. At this price point, honestly, there isn’t a whole lot of items I would change on Sig Sauer’s M400 Tread. The barrel is capable of minute of angle accuracy or better in the right hands and proper ammunition choice. While I prefer 4150 CMV steel for a barrel with either a chrome-lining or a nitrided finish, the barrel on the M400 Tread works well. The receivers are of great quality, fit and finish. The ambidextrous magazine release, over-sized bolt release, ambidextrous safety, and polished firing control group are all enhanced features that are nice additions to the original design of Eugene Stoner. The trigger would be the first thing I would upgrade, but it is one of the better mil-spec weighted triggers as far as smoothness goes. I would also upgrade the charging handle to an ambidextrous model from either BCM or Radian. 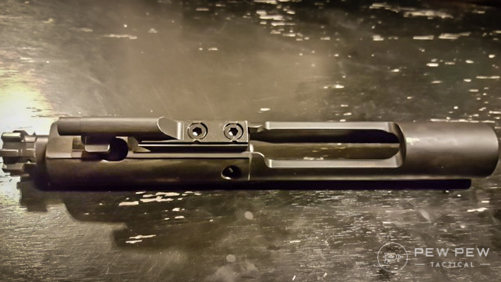 We’ve reviewed both of those and a lot more in the 10 Best AR-15 Charging Handle! 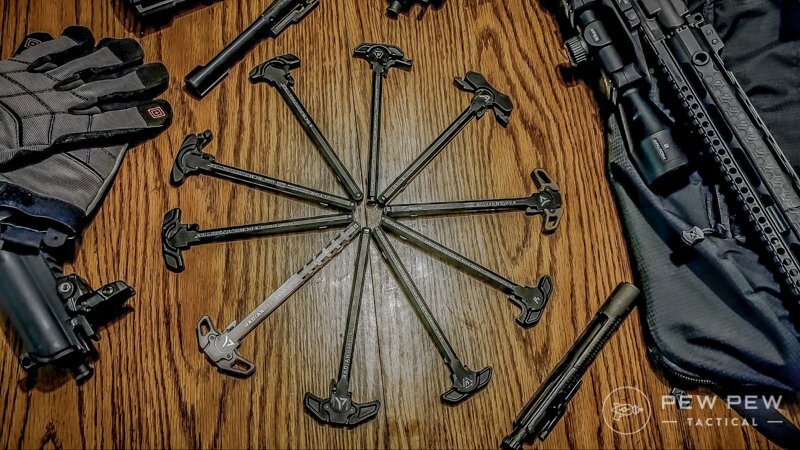 All 10 tested and reviewed AR-15 Charging Handles! The Magpul stock is a great feature as well which is comfortable to many different body types and it looks good with the minimalist look of the handguard. This rifle is not marketed to be lightweight but at 7 lbs. and for how well it balances, the M400 Tread is a joy to shoot and be slung on your shoulders. It would be nice if Sig added an additional MLOK QD point for on the handguard though. While running the Sig M400 Tread, it ate everything that I fed it. The round count was relatively low as only about 800 rounds were fired, but between the nitrided bolt and mid-length gas, the Tread’s operation was silky smooth. While I have shot more accurate rifles with higher grade barrels, for the price point, the Tread has an excellent barrel. The mil-spec trigger has a smooth pull but would be a smart first upgrade in my opinion. The M400 Tread will fit just about anyone. The MOE SL-K is 6-position adjustable and Sig’s grip is a lot like the Magpul MOE. The handguard provides for an excellent C-Clamp grip. The ambidextrous and enhanced controls are a step above other manufacturers. The Tread is different than other rifles in regards to the handguard. While I was undecided at first, after handling the rifle, I do not doubt the ergonomics. 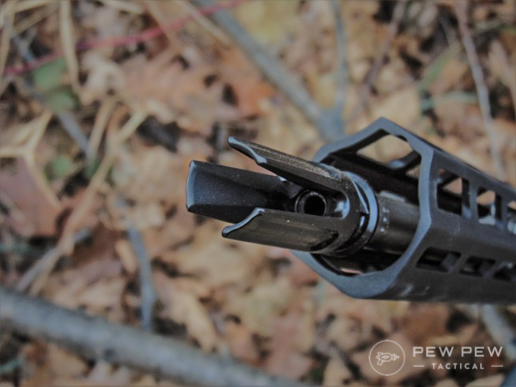 The 3-Prong flash hider is also a great addition compared to a standard A2 birdcage. Aftermarket accessories can be purchased from Sig, with their 3-Chamber compensate. 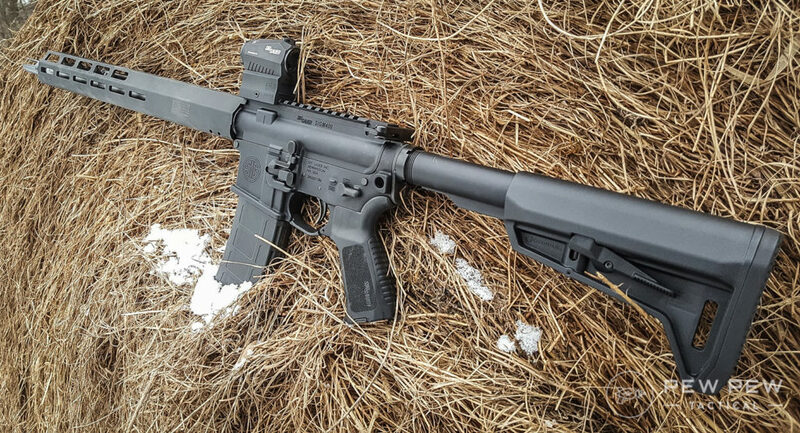 A shorter, lighter 13″ handguard can also be used over the 15″. Sig also has their own marketed flip-up iron sights. For the price, Sig’s more entry-level friendly rifle is a good value. Frequently listed at $799, this rifle proved to be very accurate with high-end enhanced features commonly found on more expensive rifles. I would highly recommend this rifle. Like stated before, it is a jack of all trades and would do well as a hunting rifle or for an entry level rifle for 3-Gun competitions. If you’re looking to get into the AR-15 game this is a great pick for your first or even second rifle. If you want a bargain bin AR-15, there are cheaper options than the Sig M400 (check out our Review of PSA’s rifles). But if you’re looking for a rifle that is ready to go out of the box and is a cut above much of the other starter rifles, then the M400 might be perfect for you. Do you already have a Tread M400? Tell us about it in the comments! Once you pick your first rifle, don’t forget to get AR-15 Optics and Best 5.56 Ammo! For home defense, I would think a shotgun would be a first choice followed by a handgun given prior instruction and practice. Problem with rifles is penatration, actually over penatration. You might actually be friends with the people next door, on the other side of those thin walls. That blank spot on the hand guard looks so bad, just terrible. What is their reasoning on this? Everything else is good, just ugly AF. Tried earlier, didn’t work, make one last effort. The M-16 rifle was designed with a 20″ long barrel, appropriate gas system, rifle length and barrel gas tap. Seems that 16″ long barrels, some shorter than that have become all the rage, I wonder why. While shorter barreled versions have definite military applications, do they well serve civilian rifle requirements? I would think not, though I’ve been wrong before, and might be wrong here too. Am I? Shorter barrels are much easier to handle and maneuver with but at the cost of bullet velocity. 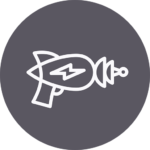 However, since the AR-15 isn’t really designed to be a long-range rifle anyways, the loss of that velocity is not highly important for many applications. Most of my ARs are 16″, one is 14.5″, but my 6.5 Grendel and .224 Valk ARs are both 20″ since they both are meant for long range use. Have you given any thought to 24″ barrel in your 6.5. I Would imagine the longer sight radius, with iron sights, would help, and likely increased muzzle velocity would also be a consideration. As for “shorter barrels are easier to handle and maneuver…..”, that is true and for military use could be a worth while factor. For likely civilian use, does it matter. By the way, I might well be outmoded, as my rifle shooting was with 30-06 and 7.62mm NATO (.308 Win), and 24″ barreled rifles. In any case, thanks for your thoughts. If I was doing a bench rifle I would have gone with the 24″, but this is a deer rifle for me and being out West it’s a lot of stalking, walking in and out of canyons, and dealing with a good bit of brush. So I wanted a barrel that was a bit shorter to make that all easier. I don’t have irons sights on any of my rifles (other than my Lee-Enfield). I would say that for something like a home defense rifle, maneuverability is critical in a civilian application. For home defense yes a short barrel helps, this is not a marksmans rifle that requires a 20+ barrel for reaching out for longer ranges. In a personal defense situation in your home a 16” or shorter barrel has massive advantages. You don’t see SWAT officers storming buildings with a M16A1 and there’s a reason for that. A carbine length or shorter AR definitely has a civilian use. Have had mine for 3 months, maybe 250 rounds. So far so good. Just a red dot on it. Put a Miculek compensator on it. Stays pretty flat. Was nice to easily remove the rail to clamp barrel for removal of orig flash hider. Tightened down the two screws and the handguard settled in tight and exact same clearance around the gas block as before. Impressed so far. Hanguard grew on me quickly, not sure if I’ll upgrade. Wasn’t sure which guard felt better, the Sig or my sons DDV11 I had with me that day. I’m going to be in the market for an AR very shortly and the Tread was on my list. Can you, or anyone, speak of it comparatively to a Radical Firearms AR? I’m just curious if the extra ~$150 is worth it for the Tread or if I’d be better off using that money for new barrel or an optic. Love the article, thanks again. Stay far away from Radical. Terrible quality control, worse customer service.